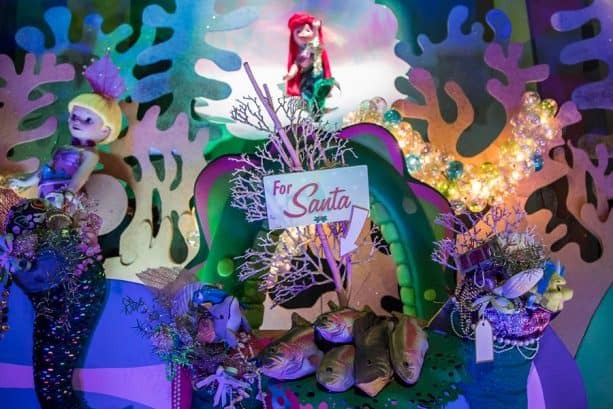 Where better to celebrate the Holidays at the Disneyland Resort than on the happiest cruise that ever sailed? The façade at “it’s a small world” gets a festive makeover this time of year, featuring thousands of brilliant lights and a Santa hat atop the clock face. 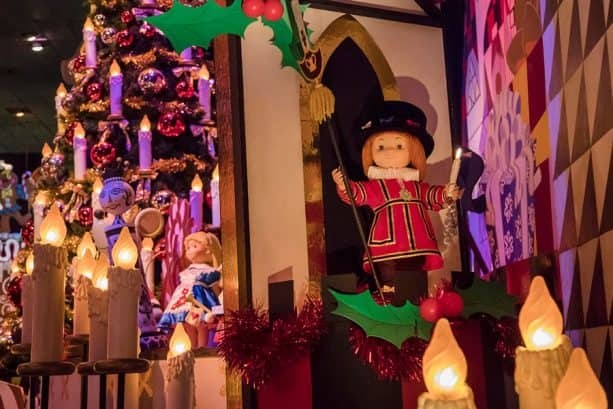 Filled to the brim with colorful characters and festive décor, “it’s a small world” Holiday offers seasons greetings from more than 300 children around the world. Sailing along these wondrous waterways, it’s easy to miss some of the smaller details. So, let’s hop in, sing along and look closer at some of the special elements of this beloved attraction. Seasonal touches appear all around you as soon as your ship sets sail. The voyage begins in the northern regions, where snowflakes sparkle and letters addressed to Santa are scattered about. The distinct silhouette of Mr. Claus himself is visible in the upstairs window of a quaint snow-covered cottage. Then, float over to Europe, where two ceremonial guards dressed in scarlet and gold await your arrival. On a perch adorned with holly and tinsel stands one of these two Yeoman Warders, protectors of the Tower of London commonly known as Beefeaters. In fact, Beefeaters themselves are often represented in Christmas ornaments and décor. Soon, journey to Asia, where everything is completely decked out for Lunar New Year. Check out the vivid neon dragon positioned amongst fireworks, hand fans and celebratory drummers. Dragons are especially important this time of year, as the dragon dance has long been an essential part of Chinese festivals. 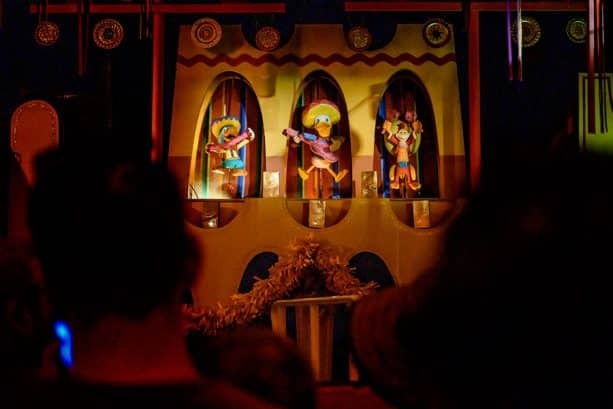 Passing through South America and Mexico, glance upwards to spot three familiar faces, the Three Caballeros! Donald Duck, José Carioca and Panchito play various musical instruments as piñatas twirl overhead. 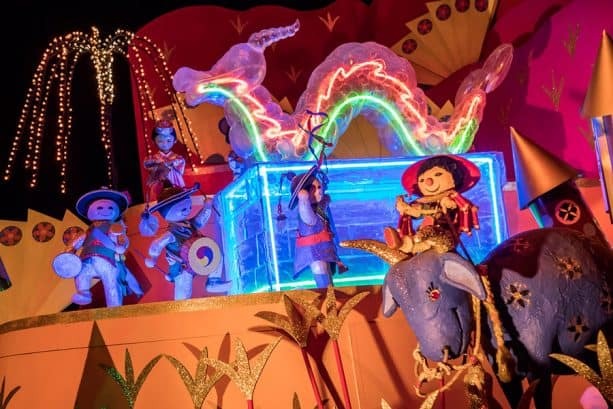 While these three best friends can be found at “it’s a small world” any time of year, be sure to catch them over at the limited-time Disney ¡Viva Navidad! Street Party. There, they host the party from atop a colorful float adorned with streamers to celebrate the holidays, culture and friendship. 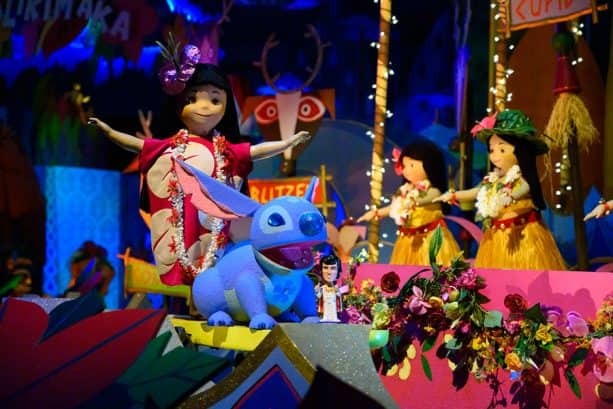 Devoted Disney fans will remember how much Lilo & Stitch adore Elvis. For an extra special holiday touch, look out for an Elvis bobble head in front of the dynamic duo as the group catches a wave together. The next section of the attraction truly captures the spirit of America. You are nearing home now, but keep your eyes peeled for a few furry friends! Every so often, gophers dressed in Santa hats pop out from a snowy knoll to say hello to visitors passing by. Across the way, look closely at the three Native Americans to discover an unexpected treat in their hands: popcorn! In fact, the practice of popping corn was common among Native Americans even hundreds of years ago. 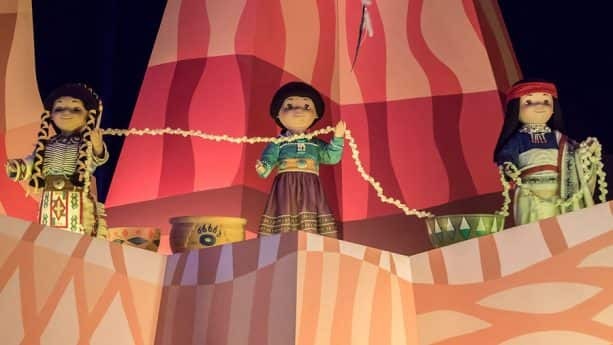 This time of year especially, “it’s a small world” Holiday reminds us to appreciate our differences and unite in the bonds of song, friendship and happiness. Thanks for coming along with us on the happiest cruise that ever sailed, we wish you a very merry holiday season! 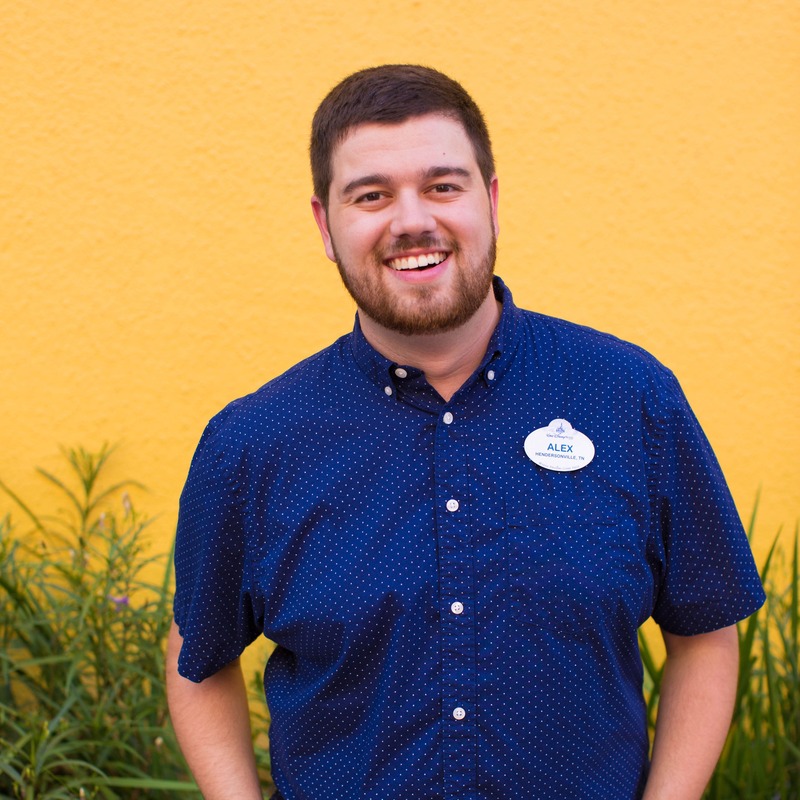 I’ve been fortunate to have seen every Disney park, every Disney attraction around the world. 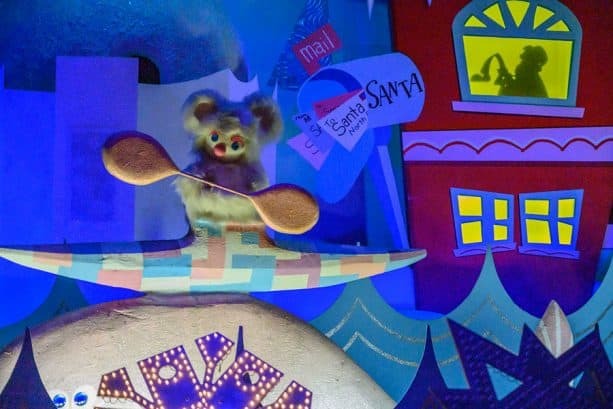 I can say with complete certainty, that the “Small World Holiday” is the most joyous of any attraction I have ever seen. Every season I am swept by its lights, melodies and message. If you have never seen this, you must make it part of your basket list. The decorations are beautiful! I need to see Halloween live someday! Great job to transform the rides for the holidays. It’s truly brilliant!